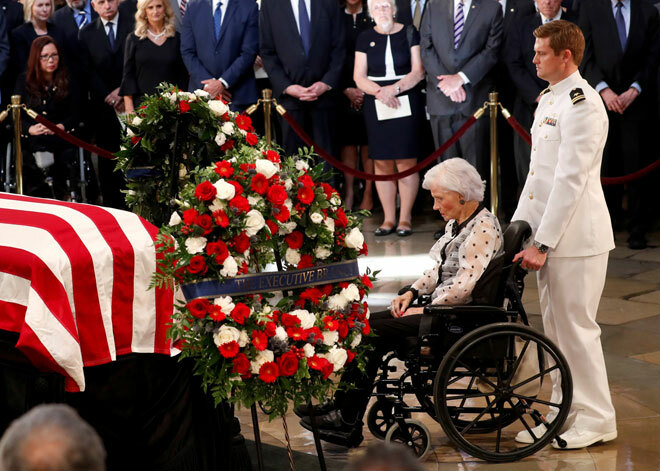 WASHINGTON: When John McCain’s flag-draped casket was carried into the US Capitol Friday, among those honoring the senator was a woman who lived through the turbulence of his iconic career and life: his 106-year-old mother. Half a century after she was told her son had been shot down over Vietnam — where he was held prisoner for five years — Roberta McCain cut a stoic figure at the memorial for the statesman, who died last weekend following a battle with brain cancer. It was the first time Roberta McCain joined the ceremonies, which began earlier this week in McCain’s adopted home state of Arizona, to honour her son. Dressed in a translucent polka dot outer blouse, she remained composed throughout the hour-long Capitol tribute as vice-president Mike Pence lauded her ‘American patriot’ son and congressional colleagues praised him as a national treasure. McCain was a brash US Navy fighter pilot who cheated death on multiple occasions. But in 1967, Roberta McCain was convinced she had lost her son forever. She and her husband were in London, dressing for a party at the Iranian ambassador’s residence, when they got a call saying her ‘Johnny,’ as she continues to call him, was shot down over Hanoi, and there was no evidence of an ejection. Roberta McCain has often been asked how she coped with her son’s lengthy detention in Vietnam. “My husband chose his profession, and so did Johnny,” she told Time of the ordeal.